Papad mangodi ki kadhi is a tasty dish from colorful land of Rajasthan. Mangodi is a small sun dried dumpling made from soaked and grinded moong dal (split, skinless green gram). This kadhi is much liked by my family so I make it often. 1. In a pressure cooker, heat 2 tsp oil and add mangodi. Fry mangodi till reddish brown. Turn off the heat. Add 1 cup water and close the cooker. Let it stand for 15 minutes. Then while still cosed, pressure cook mangodis to 2 whistles (please check before pressure cooking if there is some water left otherwise add some). 2. In a deep bowl, take curd, besan, turmeric, red chilli and coriander powders and salt. Add 4 cups of water. Blend with a hand blender, mixer or a big spoon into a lump free smooth mixture. 3. Heat 1 tbsp oil in a kadhai/wok and add methi dana. When they turn darker, add hing. 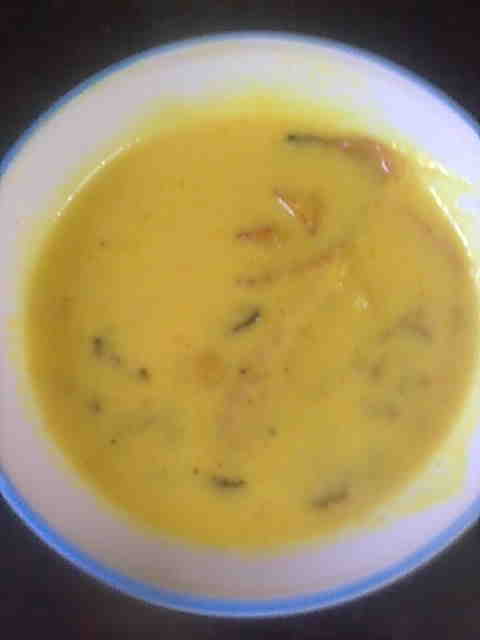 Add the besan curd mixture and cook stirring till the kadhi comes to a boil. 4. Add mangodi and turn the heat to medium-low. Cook for 20 minutes, stirring occasionally. 5. Add papad pieces and cook for another 5 minutes. Serve hot papad mangodi ki kadhi with rice or roti.